Cardinal Luis Antonio Tagle of Manila answers audience questions at St. John Vianney College Seminary, Miami, after delivering the annual Fides et Ratio lecture, March 22, 2019. “Every life, especially that of a pastor, will be full of crosses. That’s the Jesus that we are following. If you start looking for a life without crosses, you’re in for disappointment,” he told the Florida Catholic. In the ancient world, being a servant meant being someone else’s property. In the Judeo-Christian understanding, servanthood came to be understood as covenant. A servant is not God’s property, nor does he merely “work” for God. As Jesus showed by his example, God serves everyone, because God loves everyone. “If I belong to God, I will serve everyone, even my enemy,” the cardinal said. Similarly, a shepherd will lead his flock to his master. But “what if God is not the master of the shepherd? 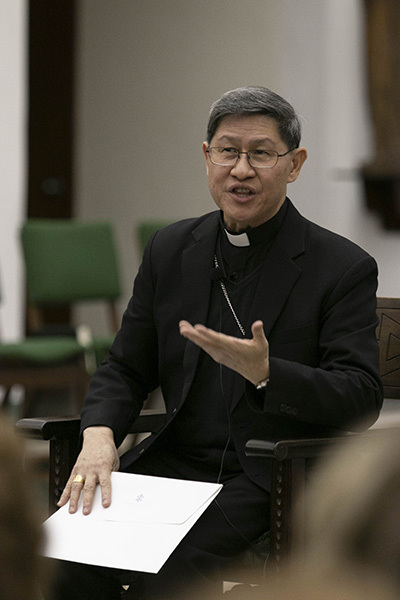 To whom will he lead God’s people?” Cardinal Tagle asked, listing some of the temptations that can take the place of God as masters: honor, prestige, comfort, status.